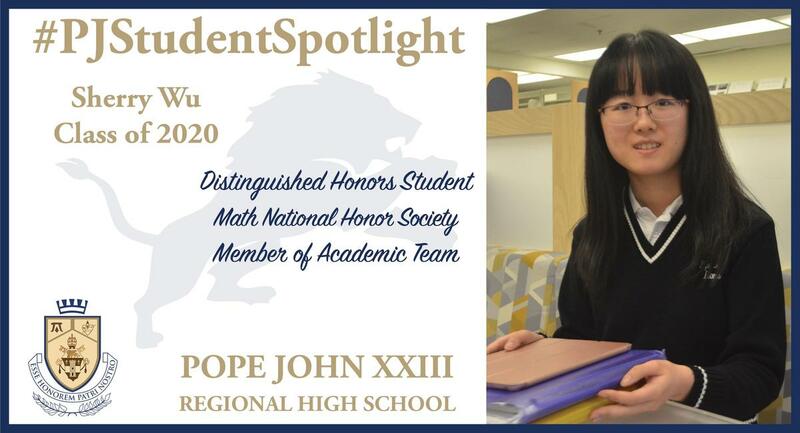 Wu is a junior and an international student who has demonstrated her great talents while at Pope John. We at Pope John XXIII Regional High School want to share with you a new series called “Pope John Student Spotlight” in which we recognize our students’ talents and achievements! Today, we want to showcase Sherry Wu! Wu is a junior and an international student who has demonstrated her great talents while at Pope John. She has earned Distinguished Honors in the classroom while taking courses such as AP Calculus BC, AP Physics, AP Macroeconomics, AP Psychology, Honors English III, Honors Japanese, and Honors U.S. History II. Wu also has been a catalyst to the Math Honor Society’s participation in math competitions this year, including the American Mathematics Competition. In the AMC, Wu scored well enough to qualify for the American Invitational Mathematics Exam and place her among the top five percent of all high school math students who take the AMC test.In addition, Wu has has been a member of the Academic Team, FTC Robotics club, Science League, Key Club, the National Honor Society, and World Language Honor Society.